Grey foxes are the most cat-like of all the canids. They are the only canid that can climb trees. When the Europeans first came to North America, they tried to use Grey Foxes for their fox hunts. The foxes would go straight up a tree and escape the hunters. Smart little foxes! Grey foxes are omnivores so they eat just about anything, but mostly small mammals, reptiles, frogs, insects, fruits and nuts. They can live from 10 to 12 years in captivity. They can have up to about 7 but 4 is common. 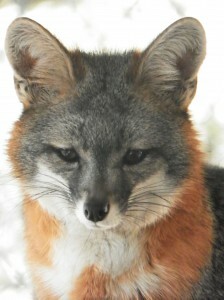 Grey Foxes are found throughout North America including Southern Canada all the way down to portions of South America. They do not seem to occur in some of the Northwestern mountainous, or Great Plains regions of the United States. Grey foxes are the most cat-like of all the canids. They are the only canid that can climb trees. When the Europeans first came to North America, they tried to use Grey Foxes for their fox hunts. The foxes would go straight up a tree and escape the hunters. Jorja – Came to us in 2005 as a baby with her eyes still closed. She imprinted on humans and cannot be released. Penelope (aka: Penny) – Was found in the desert, on the side of a highway in 2007 as a baby. She was fed with an eyedropper and quickly considered her caretaker her mother. Penny is imprinted and cannot survive on her own in the wild. Motown – Redlands Animal Control found him in 2009 as a baby and brought him to us to raise. He is also imprinted and cannot be released. All three of them live in a single exhibit and get along very well. They have areas where they can climb and Jorja and Penny are almost always together on the highest shelf in the exhibit.